While hiring intentions among Australian employers remain positive, their employees feel let down on the training front and many are actively looking to switch jobs, the latest report by recruitment firm Hudson has revealed. The report tracked the hiring intentions of more than 2,000 employers, as well as the attitudes of 1,330 employees in April this year. 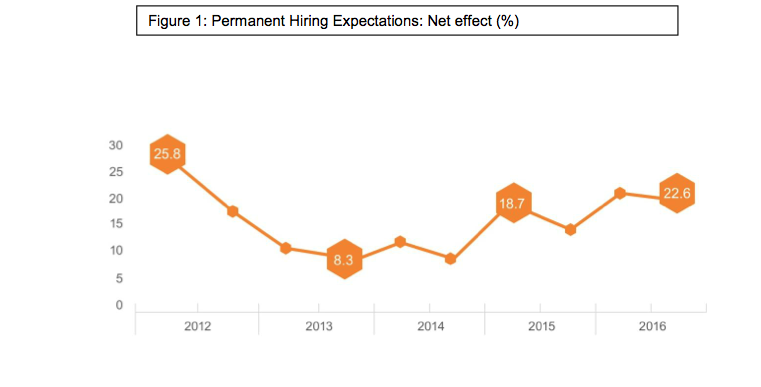 It suggests that the job market is set to remain buoyant going into the second half of 2016, with almost 1 in 3 employers (31.7 per cent) planning to increase hiring, creating a net effect of 22.6 per cent– a slight dip on the first-half outlook, but still higher than the preceding four years. The net effect is calculated by taking the percentage of employers surveyed who intend to increase permanent staff levels over the next six months, and subtracting the percentage of employers who expect to decrease staff levels. “It appears that despite confusing economic and political signals, employers are getting on with the job at hand and investing in the people they need to grow their business,” said Dean Davidson, executive general manager, Hudson Recruitment Australia & New Zealand. However, these plans could be complicated by a wave of staff departures, with the survey revealing that 44 per cent of employees are actively looking for new opportunities – up from 26 per cent late last year. A further 32 per cent are open to hearing about opportunities, with only 24 per cent content to stay put. alarm bells for employers, who will need to redouble their retention efforts and be ready to manage an uptick in staff departures,” Davidson said. skills is important or extremely important, while 60 per cent feel more pressured to learn new skills than two years ago. Unfortunately, however, 1 in 2 don’t feel supported by their manager to improve their existing skills. The survey also reveals a mismatch between individuals and their employers regarding the skills in demand. Digital literacy, for example, is third on the list of soft skills employees want to develop, but at no. 10 for employers. Where they do see eye to eye, however, is on the ability to drive and manage change: it’s at the top of employers’ wishlist and second on employees’. “These results show that organisations need an in-depth understanding of the skills and competencies required for their people to perform effectively, as well as a plan to develop their leadership capability. The starting point has to be a conversation around what benefits both the individual and the organisation, so they can see the areas of alignment,” Davidson said. The ACT is leading the country in terms of growth, where almost 1 in 2 employers are looking to add staff. Technology and professional services, in particular, are flourishing in the nation’s capital. The report suggests that the Western Australia, Queensland and South Australia job markets have started stabilising after a tough year in 2015, while NSW and Victoria continue to perform strongly, with hiring intentions tracking in line with the national outlook.